In the mid 1950s, chevrolet was making cars that would soon be recognized as classics. 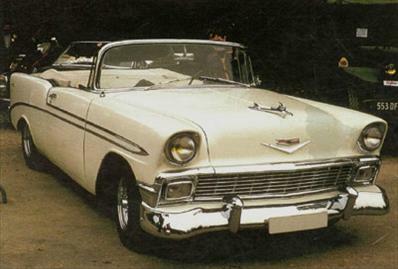 After a record-setting 1955, chevy publicized the 1956 models with the slogan, the hot ones even hotter. the hottest of the hot was the bel air convertible. Souped-up v8 engine for this model year, the chevy eggcrate grille became a wider lattice-style one, flanked by rectangular parking lights. Other style changes included a flatter and longer hood, jazzier taillights and reshaped wheel openings. The standard engine remained the blue flame six-cylinder, but this time it reached 140 hp. Only $99 more bought the turbo-fire v8. For 1956 there was an optional souped-up super turbo-fire that reached 225 hp. color combos chevys only convertible was in the top-end, deep-pile-carpeted bel air series. For 1956, bel airs had two side chrome strips joined near the headlights. The upper one shot up to the rear window, while the lower one curved down to the rear bumper. The space between these strips was often filled in a second color that included the entire rear deck. At least 10 solid colors and 14 two-tone combinations were offered, and there was a choice of 51 interior colors. Chevys 1956 bel air convertible had a new side chrome-strip treatment and a wider grille. The v-shaped metal below the marque medallion on the hood indicates a v8 engine.